Just like that, our hometown-hosted Super Bowl has come and gone! The excitement surrounding this particular Big Game was felt throughout our city of Atlanta and we hear we made quite an impression with our southern hospitality and all around fantastic spot to celebrate – mostly due to the uncharacteristically fantastic weather this weekend. But unlike Super Bowl LI, when we had a team to cheer for, what we were really here for this year was the ads. While none stood out enough to go down in history with Tom Brady as “GOAT”, we could clearly identify the overarching themes that a majority of the commercials included. It seems Super Bowl advertisers are finally beginning to realize the value in appealing to the female audience. It’s estimated that 49% of the big game audience in 2017 was female, so it only makes sense, right? Historically, it wasn’t that women were absent from starring in Super Bowl commercials, but perhaps you could argue they were featured in slightly off-kilter roles, like bikini-clad car washers and burger eaters (or both). But this year, things changed. Advertisers clearly made a point to include more female leads and messages about female empowerment without alienating the male audience too. Bumble started the night off with an empowering ad featuring Serena Williams, while Olay snuck in a funny bit almost entirely speaking to women. It will be interesting to see how the game, performers and commercials adjust to represent all genders moving forward. Robots took over the ad space this year, quite like they’ve taken monopoly over Christmas gifts in recent years. While some discussed the fears and dangers associated with a robotic world, others touched on the importance of leading technology making life easier for those with disabilities and health inconveniences. Smart-technology is clearly a hot discussion and smart-home robots are often made into jokes and memes on social media, especially robot fails, like this commercial a la Amazon. Leading up to the Big Game, Pepsi was in full force here in Coke country. They took over Coca-Cola’s jurisdiction with (maybe a few too many) billboard and display ads throughout the city, the Atlanta airport and online. 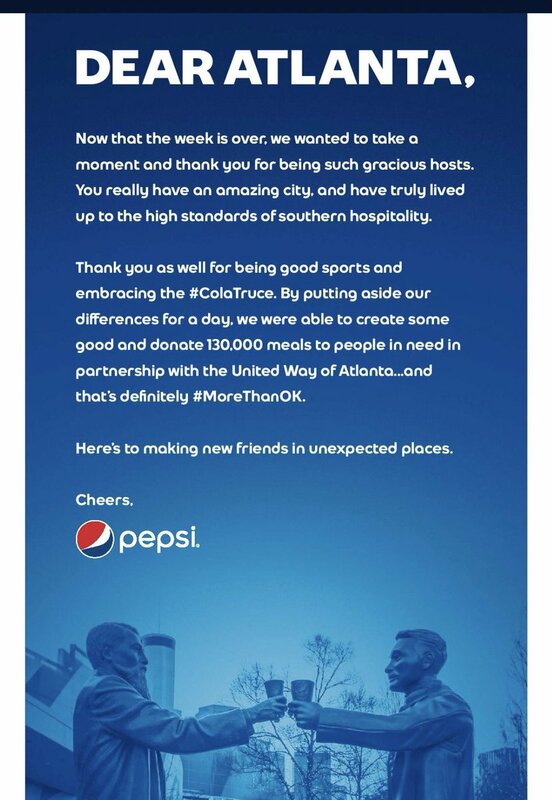 Despite the overt takeover, both Pepsi and Coke were pretty good sports about the whole deal, with Pepsi releasing a statement via full-page spread in the AJC Monday morning announcing their donations to the United Way. A lot of brands tried to take a social or advocacy stance with varying degrees of success. We all agreed the most effective was Microsoft’s “When Everybody Plays” highlighting children with their adaptive game controllers. It was authentic and strongly dovetailed with Microsoft’s mission (“to empower every person and every organization on the planet to achieve more”). Google’s translation and veteran spots were pretty successful on this front too, though less evocative overall. While we appreciate the causes they’re fronting, the big beer spots in particular were a little confusing in terms of relating to their brand image and core audience. Organic ingredients and alternative energy seemed a little forced next to the standard Bud Knight approach, but maybe we’re too focused on motive. Though while we’re talking about motive, the Verizon first responder ads – which in and of themselves were lovely stories and certainly highlighted real heroes – seemed like such a blatant damage control response to the California firefighting data throttling debacle from the fall that it was hard to give Verizon any credit for them. Opinions on success aside, it’s nice to see brands creating advertisements focusing on bettering ingredients, materials and processes to create a better world for all. What were your big takeaways from this year’s Super Bowl? See our personal favorite commercials below and tweet us your favorite commercial at @cca_creates! Serena’s Bumble commercial… chills. I want to watch this every morning before I start my day. Three diverse but uniquely funny spokesmen and spokeswoman to bring comedic relief surrounding the light hearted controversy of Coca-Cola vs. Pepsi is exactly what makes the commercials as much fun to watch as the game itself. I enjoyed the Amazon Alexa Fails spot – it was lighthearted, they were able to poke a little fun at themselves while highlighting their ongoing innovation and maybe mostly because any ad that pairs Harrison Ford with a tiny terrier is hard to argue with in my book. The Stella Artois commercial was overall fun, surprising, nostalgic, and a great use of cameos. I also appreciated the commercials getting back to the funny, lighthearted world. Although there were a few spots that hit home with some of the social issues that plague our nation (which is good in small doses), we weren’t overwhelmed by guilt as in years past.